What does First Amendment mean? The First Amendment to the US Constitution protects against laws prohibiting the freedom of religion, speech, and the press, as well as the right to assemble and to petition the government. Where does First Amendment come from? 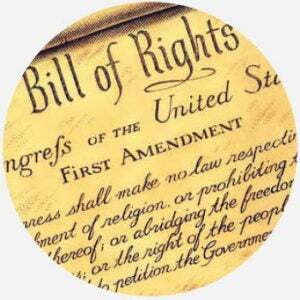 The First Amendment is the first amendment in the Bill of Rights, which includes the original 10 amendments drafted immediately after the Constitution of the United States was ratified in 1788. Here, amendments are changes or additions to the Constitution that aren’t part of the original document. In 1787, members of the Constitutional Convention gathered in Philadelphia to revise the founding document of the country, the Articles of Confederation. They decided to create a new one instead, and by September, they’d drafted the Constitution. Getting the new document approved, however, was another story. Many opposed this new Constitution because it didn’t specify the rights of the people. The Constitution was only passed after Congress promised to add a list of rights afterwards. The freedoms this amendment protects—religion, speech and the press, assembly, and petition—are called the First Amendment freedoms or rights, both officially and colloquially invoked in the US. Due to its brevity and ambiguity, issues regarding the interpretation of the First Amendment have been perennial points of debate throughout American history. The specific application of these rights, like other rights, has been a matter often judged by the Supreme Court. For instance, cases have determined that the First Amendment’s free speech clause doesn’t protect “fighting words,” which is defined as speech intended to cause injury or breach of the peace, and that school libraries can’t remove books because school officials disagree with their content.